A lie only is effective if you choose to believe it. The fact that you believe something does not, in itself, make something true. Sadly, in today’s world where knowledge is ever increasing, so much of what the average American believes is not true. because we want it to be. Denial of the truth does not make the truth go away. Truth does not have two sides. Truth is not fair and balanced. Truth stands on its own two feet and is never diminished by debate. Opinion is not truth and truth is not an opinion. At the core, the battle raging in America is over truth. As damaging and discouraging as it might be, only truth can lead to freedom. Believing you are not sick will not make you well. Thinking you are free does not make it so. Hoping for the best does not cancel consequences. So much of what we believe simply is not true. We are told that religion and politics make strange bedfellows, but I am not so sure that they do. Much of religion is fraught with half-truths manipulated by the will and desires of sinful men. Politicians are much the same as our religious leaders. They manipulate the truth because the results justify the methods. If I may toot my own horn for a second, I was a fairly successful high school coach of a variety of sports and one of the reasons I was successful is that I was direct. I refused to lie to myself or to the players about what was required. Most successful coaches have enemies and in most cases the enemies will be those who choose to deny truth. Truth places blame in the proper lap. Truth limits the ability to parse and point fingers. Truth is the touchstone of cause and effect. That is why it is so freeing. There is no way to find the proper cure if one is not willing to diagnose the proper cause. Pro-aborts dehumanize the unborn. They have to. How else could they get away with murder? For over four decades they have told us lies about the pre-born. 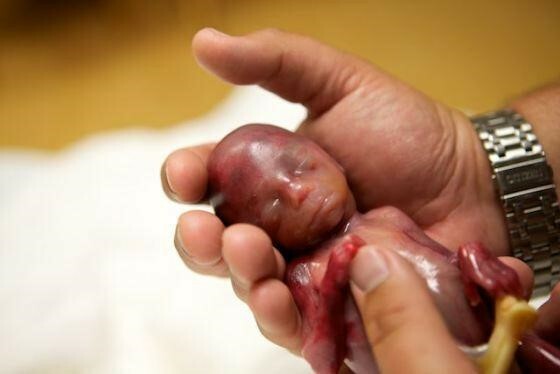 You can rattle them off…it is a fetus…it is not viable…it cannot think…it has no self-awareness…it is a blob of tissue…it is a clump of cells…it is part of the woman’s body. It is the same argument that the Nazis used with the gas chambers, and that the lynch mobs used with blacks. The dead weren’t totally human, so therefore it was okay to exterminate them. But we knew better. We all did. We knew it when Dred Scott declared that blacks weren’t fully human and when Hitler declared that the Jews were sub-human. We knew better. We know better today. Our ignorance is simply…convenient…willful…selfish. Calling an unborn human being non-human does not make it so. Take a look at this picture. It is harsh. It is convicting. It is tragic. Yet we know it is real. We know that “thing” growing inside a woman is a baby…what else could it be? Calling it by some other term does not make it any less human. Making it “legal” does not make it right. You would have to search long and hard throughout history to find anything as massively evil as the willful slaughter of an unborn human being. Yet this action is commonplace in America…legal…in a nation that loves to talk about fairness…diversity…equal rights…and protecting the weak. Abortion is the ultimate bullying, in a nation that claims to decry the powerful picking on the powerless. What could be more helpless than an unborn child totally dependent on the love of another? Yet we legalize it…glorify it actually…grant special rights and financial support to those who engage in the practice of it. Love thy neighbor? Give me a break. Child sacrifice is all one big lie. We all know the truth. Our judges know it. Our elected officials know it. Our police officers know it. Planned Parenthood knows it. The Republican Party knows it. The Democrats know it. But our pastors know it too. And so do the disengaged men and women sitting in the pews. They know blacks are not 3/5 human. They know Jews are not animals, and they know the fetus is a living human being. life and be so cavalier about the life of another? Abortion has not made America great. As long as we permit it we will never be. Christianity is anchored upon the life of a man who identified Himself as truth. The Church was God’s antidote to the lies. Yet the church has embraced the lies. Darkness and light now are in fellowship in the house of God. Speaking such truth today is considered harsh and divisive. Child murder continues because the light has gone out in the Church. Abortion is murder and murder is not lawful. It is not healthcare. No one has the right to choose death for another. Abortion is mean. In our hearts…we all know that. America will never be great as long as we kill our offspring. Stop the denial. Only the truth can set us free.